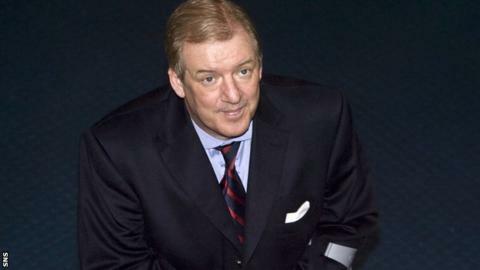 Rangers have been the victims of a "retrospective witch hunt" according to former owner Sir David Murray. Sir David was speaking after "oldco" Rangers were fined £250,000 by an SPL-appointed commission. The commission, chaired by Lord Nimmo Smith, was investigating alleged undisclosed payments. "The problems arising at Rangers brought no credit to Scottish football and have been a tragedy for the club and its fans," said Murray. "They cannot be condoned. Similarly, however, and as stated previously, efforts to bayonet the wounded are equally unjustified and of no benefit to the club or Scottish football." The investigation related to the period between 2000-11 - during Sir David's tenure - when Rangers operated employee benefits trusts (EBTs), the subject of a long-running tax tribunal. "The decision not to strip Rangers of titles is satisfying," said Murray. "The commission recognised that the purpose of the relevant SPL rules was to promote sporting integrity and that Rangers gained no competitive advantage. "The EBT scheme did not provide for payments from the club to the players. Instead, the players received loans from independent trustees and the decisions to make those loans were made by those trustees alone. The decision of the First Tier Tax Tribunal supported this. "It is entirely erroneous and without foundation to state that a contribution to a trust and subsequent loan from independent trustees of that trust to a player is the same as Rangers making a payment to a player. "Despite knowledge of the existence of EBT arrangements for 10 years, the SPL has never explained why this was only raised as an issue last year," added the former Ibrox chairman. "The imposition of an irrecoverable fine on an entity which is now in liquidation is futile and only prejudices the ability of existing creditors to recover any money. "It is saddening that so much time, effort and money has been expended in pursuing a retrospective witch hunt against an entity in crisis, as opposed to seeking to promote and further Scottish football for the benefit of the game and country as a whole."